We are ready to host you at our PARADISE BEACH CONDO--with power and water! Ahora con Wi-Fi, nuestra unidad de 2 BR-2 BA, planta baja, totalmente equipado está ubicado en una comunidad cerrada y tiene capacidad para alojar cómodamente a 6 personas. Hay una cama king size en el dormitorio principal y 4 camas de una plaza (2 literas) en el segundo dormitorio. Hay dos baños completos para su conveniencia. La cocina está totalmente equipada e incluye lavadoras y secadoras. La sala de estar/comedor tiene una unidad de aire acondicionado, así como las dos habitaciones. Los accesorios adicionales incluyen: parrilla a gas, dos televisores de 30" con Roku incluido, tres sillas de playa, toallas de baño y playa, dos cofres de playa, ropa de cama, secador de pelo, plancha y tabla de planchar, juguetes de playa y juegos de cartas. Se encuentra a solo unos pasos de la piscina y a 200 metros sobre grama de una de nuestras playas vírgenes, canchas de tenis y área para jugar. Ofrece estacionamiento asignado para su conveniencia y se encuentra dentro de los 5 min. conducir a la selva tropical de El Yunque, 30 min. del Bio-Bay, 5 min. a Luquillo Kiosks, cerca de 5 cursos de golf y ferries a las islas de Vieques y Culebra. Supermercados, farmacias, restaurantes y excelentes tiendas también están cerca. El aeropuerto está entre 30-40 min. Distancia de conducción. ¡Es un lugar excelente y asequible para unas vacaciones inolvidables! There is also a table and 4 chairs in the terrace. Outdoor terrace with retractable awning overlooking the pool. Very spot for a weekend getaway. If want a great beach for yourself, a pool steps away from your patio and a grill for the afternoon, this is your spot. Thanks for all the assistance, my family really enjoyed their time at your aptartment. Thank you. We're happy to know your family enjoyed their stay. If you ever want to stay with us again, we would be honored to have you back. After being met by Jose with a bottle of welcome sparkling wine, we thoroughly enjoyed our stay. The property is in a gated community right by the pool and steps from a wonderful beach. We had everything we needed and met a wonderful group of new friends, our neighbors. The managers were very helpful, and we recommend staying at this property. Thank you for the review. We're very glad to know that you had a great time and that everything was to your liking. If in the future you want to come back you and your family will be more than welcome. Excelente! Tiene todas las facilidades que necesitas para pasarla bien en familia y amigos! Gracias por escogernos nuevamente. ¡Siempre serán bienvenidos! Bendiciones. Espectacular. Todo bien limpio. El apartamento bien equipado. Gracias por haber escogido nuestra propiedad. Fue un placer tenerles y esperamos verles de nuevo el año entrante. Bendiciones. 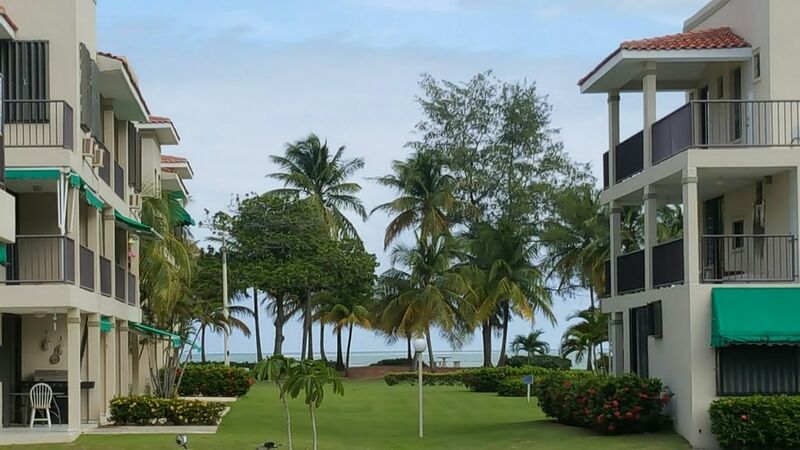 Wonderful 12 day vacation based out of a very nice and beautiful condo rental!!! My family and I have vactioned numerous time in years past in Puerto Rico but had always vactioned on the northwest side of the island, this was our first time on the northeast coast. We were very glad that we did. The location of the condo was perfect. A very short walk by the pool across nicely landscaped grounds led directly to a beautiful sandy beach. The sandy beach was protected from large waves by a reef very far out so the water was always calm and safe for swimming. Beautiful vistas of the ocean and coast can be seen descending down from the road before arriving at the private gated community entrance. Everything at the unit worked well and was very well maintained. A plus for this unit that we greatly appreciated was that the living room and kitchen were air conditioned in addition to the bed rooms. We have stayed in some other rentals without air conditioning in the living and kitchen. However, the air conditioning was not needed during the day as the unit has large operable windows on both sides that provide good ventilation. There were plenty of things to do and places to visit that were a short drive away and we particulalry enjoyed the beautiful Seven Seas lagoon and beach at Fajardo where we rented kayaks on the beach. The Seven Seas lagoon is generally protected from winds and has beautiful water and reefs for snorkeling and you can hike and swim from the very long sandy beach. Jose Luis and Mayra were wonderful hosts who made sure our stay was comfortable. We were met at the unit and shown around and they were available by phone had we needed anything. I left a shirt accidentally in the condo with some cash in the pocket when we left and Mayra saw that it was cleaned, folded and shipped to me with a check for the cash in the pocket! Great personal service!!!!!!! We look forward to returning and do not hesitate recommending this rental from Jose Luis and Mayra. Thank you very much for your review, we are overcome with joy by the fact that you were delighted by our listing and we would love to host you again in the future.